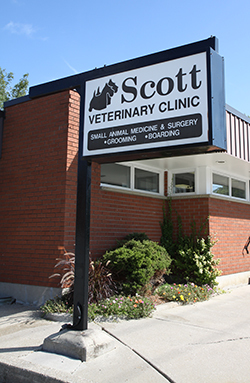 At Scott Veterinary Clinic, we take pride in delivering personalized, compassionate care to our patients and their guardians in Brantford, ON and surrounding areas. Our team strives to provide a comfortable environment for our patients and clients and we want everyone, either two legged or four, to feel welcome as soon as they enter our veterinary clinic. This all starts with a warm hello for you and a yummy treat for your pet. Our hospital has been an integral part of the Brantford community for many years, having first been opened by Dr. Scott and moving to our current location at 904 Colborne Street in the mid 1960’s. We have ample space for parking, and are located minutes from Hwy 403. We offer a wide range of medical services and surgeries for dogs and cats in Brantford. Our patients are primarily cats and dogs, however Dr. Lee also offers services for a large range of exotic pets including birds, ferrets, rabbits, rodents, and reptiles. Please visit our Services page to learn more about the services we provide. Find out more about our team on by visiting our Team page. Better yet, give us a call at (519)752-3431– we’d love to chat!